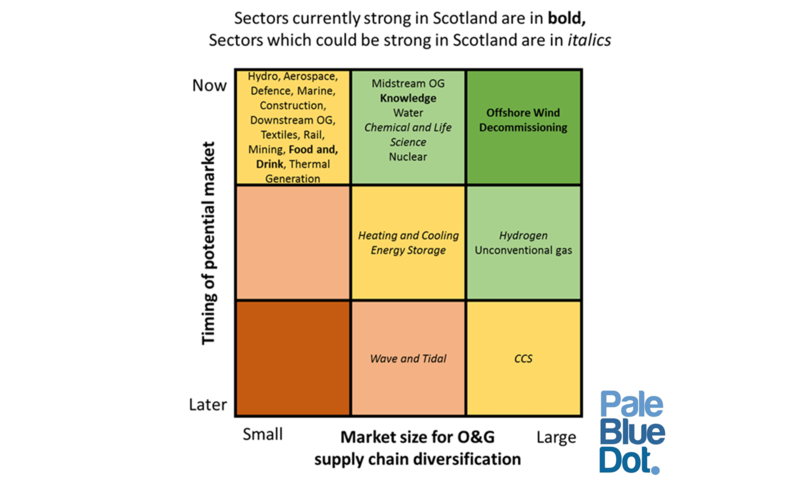 In a study on Oil and Gas Diversification for Scottish Enterprise, Pale Blue Dot Energy highlighted the opportunity for Scotland to deploy surplus oil and gas capability on emerging future energy sectors including Wave and Tidal, CCS, Hydrogen and Heat. There is too little focus on Diversification, particularly in the North East. Oil and gas businesses should develop Diversification strategies in order to manage the long-term decline in oil and gas driven by price uncertainty and the Low Carbon transition. Pale Blue Dot have just completed a study for Scottish Enterprise looking at opportunities for diversification for the Scottish oil and gas supply chain. The study considered opportunities within 24 other sectors, the potential for oil and gas capability within those sectors and the expected scale of growth in each. In addition, the work considered cultural aspects and business models associated with oil and gas supply chain market entry into alternative sectors. Organisations need to wake up to the opportunities that diversification can offer and take the time and effort required to prepare, plan and deliver a diversification strategy. Diversification is about much more than selling existing products into a different sector and organisations need to research and develop a diversification strategy. Now is an ideal time to establish a position in the emerging, high growth, low carbon energy space. Whilst not always apparent inside the oil and gas ‘bubble’, the world is in an Energy Revolution of which the current low oil price is just a small part. We are in the midst of a transition to a Low Carbon economy. The study identified early diversification opportunities in Offshore Wind and Decommissioning, both of which have direct crossover of existing oil and gas services. Other early opportunities exist in Nuclear and Water sectors. There is potential to deploy surplus oil and gas capability on emerging future energy sectors such as Wave and Tidal, Carbon Capture and Storage (CCS), Hydrogen and Heat. Doing so now would ensure that Scotland can continue to be a global leader in energy projects and services. Whilst all 24 sectors examined present some opportunities for oil and gas supply chain diversification, the opportunities presented by certain diversification pathways vary depending upon the specific nature of each organisation’s business. A chart of relative market size available to oil and gas supply chain diversification is outlined below. Successful diversification demands positive action. After an initial market review, preparatory activity should include a review of alternative business sectors coupled with assessment of core capabilities. 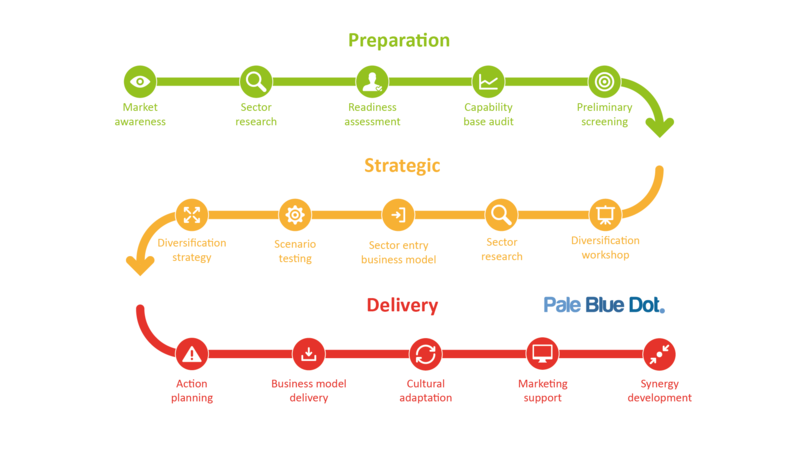 Strategic activity will follow, involving the development of a Diversification Strategy and associated assessment of a target sector and the design of a market entry plan. If Scottish oil and gas supply chain businesses engage with Diversification opportunities, potential exists to exploit the business opportunities in these high growth sectors. In the medium term this would enable Scotland to become a global leader in low carbon energy in addition to being a global leader in oil and gas. If you would like further information about this project or would like information or advice about diversifying, please get in touch.